It won't be unfair to say that for Nagappa Dattatrey Adam, life really started when he was 55. From then on, he has spent the past 35 years persistently chasing 1,500 personalities from the field of sports, films and politics. Though his appearance - wide eyes behind thick black frames, a high forehead, a wavy, grey mop and skinny built - completely masks this fervour of convincing his muse to sit still while he swiftly sketches a portrait in black ink - in less than 15 minutes! "I've always been drawn to the figurative and had a compulsive urge to keep sketching," says Adam, now 85. Among the personalities he's sketched are five former Indian presidents - Dr Sarvepalli Radhakrishnan, Shankar Dayal Sharma, Giani Zail Singh, Ramaswamy Venkataraman and Pranab Mukherjee; foreign heads of states such as former President of Brazil Dilma Rousseff, German chancellor Angela Merkel and even former Australian cricketer Adam Gilchrist. Born to a Hindi-speaking family of padmashali weavers in Solapur, Maharashtra, as a child, he'd make portraits of his classmates for Re1, and spend the money to buy ground nuts. He had to drop out of school in the sixth grade when a financial crisis meant he had to help the family man their sari shop instead. Adam used the free time in between customers to practise his art. Life continued thus until in 1990, when at 55, he took a leap of faith and came to Mumbai to attend the first edition of Mumbai International Film Festival to see what it was to sketch celebrities. He has since continued to sketch jury members, festival directors and actors at MIFF, Asian Film Festival and the International Film Festival of India (IFFI), the 48th edition of which he plans to attend in Goa this October. Adam maintains dozens of spiral bound books that contain his sketches of fluid lines, dashes and dots. Flip through his sketchbooks and you will find autographs juxtaposed with photographs of him sketching a celebrity and letters of gratitude from offices of international personalities. While he's sketched a few personalities from their photographs, a majority have been the result of direct encounters. 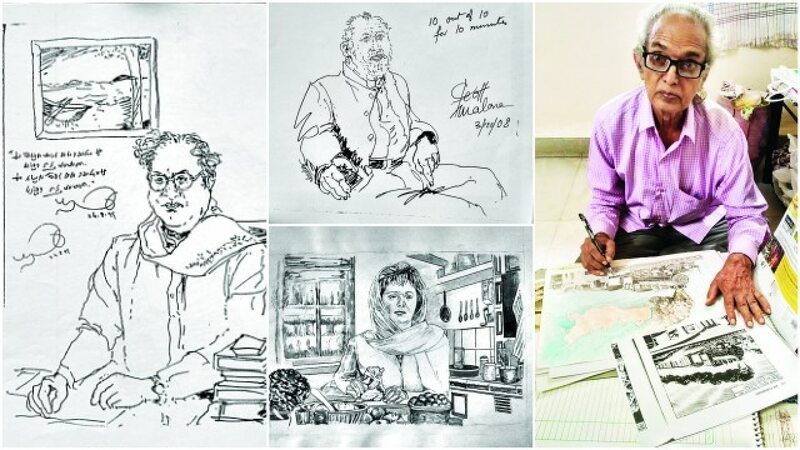 Most personalities and celebrities reimburse him, paying him upto Rs5,000 for a sketch. "It's not to help my economic status, they say, but because my art touched their hearts," says Adam. Impressed by his work, some have invited him to tea, lunch, and occasionally beer. Mother Teresa, who Adam sketched in 1995 at her Kolkata missionary centre, autographed his portrayal of her with wrinkles and gaunt eyes, with 'God Bless You'; MIFF 2008 jury member actor Geoff Malone signed '10 out of 10' and the 76th custodian of the Mewar Dynasty, Maharana Arvind Singh Mewar wrote, 'Excellent! Done in record time, thanks!'. On what would've been Lord Mountbatten's 98th birthday, June 25, 1990, Adam sketched the last viceroy of India and his wife from a 1948 file photo, which showed them perched on the ground while attending Mahatma Gandhi's last rites at Rajghat in New Delhi. "I was very pleased to have it (the sketch) and to know that my father's birthday is still remembered in India," gushed the subjects' daughter, Patricia Knatchbull, on receiving Adam's work, in a letter from Kent, UK. Adam, for whom sketching is his sole source of income, hopes to see his life's works turned into a book, but lacks funds. "I am everything because of my art, and am at most ease when I'm sketching."